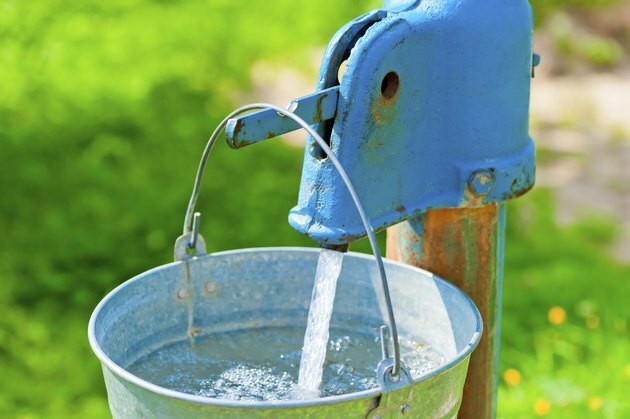 Private water wells can provide a constant, reliable source of good water. Most homes utilize one of two types of pumps in their water-well systems: submersible pumps and above-ground pumps. Both types don't make much operational noise, but there are times when it may be present. When your water well or its pump emits a clunk, it's typically not a big issue and relatively simple to fix. Water hammer heads the list for common noises associated with well pumps. Caused by water stopping abruptly when closing a water valve or faucet on the plumbing system, the resulting clunk sends a shock wave traveling through the pipes. The clunk may be subtle or substantial; it may chatter, with smaller repeating clunks, or emerge as a single, loud bang. The noise might seem to emit from the water well or the walls or floor of the well house, because of how it travels. Water hammer can occur on submersible or above-ground systems alike, and can cause damage if the clunking is severe. The most common culprit -- or the loudest clunk -- usually comes from irrigation valves closing. Another culprit is the shutoff valve on the hot or cold line on the washing machine. Other valves that can cause water hammer noises at lower decibels are located on dishwashers, toilets or faucets. A water arrester installed on the plumbing line controls water hammer clunks. Similar to a shock absorber on your car, a pressurized piston inside a cylinder compresses a spring to slow the water down gradually, preventing the noisy clunks. Arresters are placed on plumbing lines at any accessible point, individually on washer lines, on irrigation outlets or wherever needed to cushion the water and prevent it from banging. You can install smaller, threaded arresters by yourself if you can access the plumbing line. Larger arresters may require cutting and soldering the line and should be done by a professional. Sharp clunking noises may be the result of pipes too near studs in the wall. This type of clunking is more common in plumbing systems with submersible pumps, but may also occur on above-ground systems. Also known as cavitation and caused by air in the pipes, you might hear a brief clunk when the well shuts off or turns on, making pipes bump into the nearest stud or beam. Water arrestors may or may not solve cavitation issues. To prevent pipes hitting studs, pad the pipe where it passes through the wall or close to anything bumps against. Check and tighten all straps and braces that secure the pipe, including where it passes through walls. Pressure or storage tanks create softer, more subtle clunking sounds with either pump type. The tank regulates how much pressure the water has when you turn on the faucet, located close to the home or adjacent to the well-head casing. Look for an air-fill valve -- similar to a tire's valve stem -- on top of the water tank. The pressure inside the tank should equal the pressure on the pressure gauge located near the pressure switch when the system is not in use. Place an air gauge on the tank's valve stem. Add or remove pressure from the tank using a tire pump as needed and adjust the inline pressure switch in a static position within 2 pounds per square inch of the tank's pressure. Consult a professional, if you're unsure how to proceed. Because submersible pumps are deep underground, you won't hear them making noise. Above-ground systems consist of a motor and pump. If faulty, they can make mechanical sounds when bearings, fittings, shafts, housing and other mechanical parts wear out. Other clunking noises could be coming from impellers, which are fan-like blades inside the pump used to pull water from the well. When the pump turns on or shuts off -- or even while its running -- it may emit a clunking noise if any of these parts are worn or loose. Mechanical sounds require repair, or replacement of the part or the pump as a whole. What Causes a Loud Humming Noise in Bathroom Toilets After Flushing? If My Kitchen Sink Sounds Like It Has Air in the Line What Can I Do?